For many, Las Vegas is about neon and excitement in as many flavors as there are colored lights blinking on the Strip. But those of us from the Northwest we came to Las Vegas for the Laughlin River Run. A little bit of ridin’ and catching desert sun rays to warm up the ‘ol bones. And what an event Laughlin was. Headliner performances by Foreigner; a three-day tattoo convention; the Miss Hawaiian Tropics Model Search; Jager Babes Bikini Contest; Stevie Ray Vaughan Tribute band; No. 7 drink specials and t-shirt giveaways…oh yeah, and riding motorcycles in the desert! Its great to be talking about rides versus want to ride. We picked up our bikes and started out this mini-adventure by heading a few minutes outside of Las Vegas. 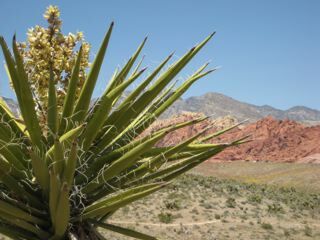 Just off the west edge of town is a great scenic ride through the Red Rock Canyon National Conservation Park. To get there all you need to do is find one of the longest roads in Vegas. We found, W. Charleston Blvd, and headed west. Charleston becomes Blue Diamond Rd. – Route 159 just past Desert Foothills Dr. As we headed out of town adjusting to the bright blue sky and mid-80’s we turned off Blue Diamond into Calico Basin and soon observed the beauty of Red Rock Canyon (red, yellow, and browns fill your sunglasses) as we approached the bluffs called Calico Basin. 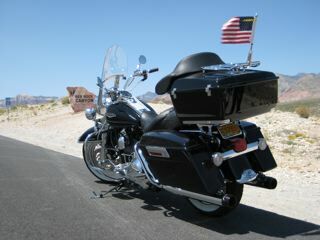 There is a $2.00 park entrance fee for motorcycles. The scenic loop is one-way, so from the entrance we enjoyed 13 miles of tarmac winding around the conservation area, dropping us off a few miles SW further down Blue Diamond. All along the ride there are turnouts to apply more sun block and where we had opportunities to stop and enjoy the view. People ask what made the Rocks red? The theory goes something like exposure to elements caused some of the iron bearing minerals to oxidize…like “rusting of the sand” which results in all the colors. Hey I can read the visitor center signs as well as the next person. After a bunch of photos and making new friends we headed back down Blue Diamond Rd. to 215 and then south on H95/93 for an approx 90 mile trip to the 3rd most visited casino and resort destination in Nevada – Laughlin. Sure CBS may be singing the blues on the cancelled ‘Viva Laughlin’ TV series, but this was the 26th year of the Laughlin River Run and fans from all over the world arrived for bikes, babes, beer and BBQ. The posse checked in at the Tropicana Express. As with all the Hotel’s during the River Run they jack the prices up to near obscene levels. The rate was $189 a night when any other week the prices was $39.99 a night. What can you do when Del Con has a lock on the rooms? The Tropicana Express is plenty nice enough and after staying in previous years at the Aquarius, Harrahs and others the Express is one of the more quite places. The crew cleaned up and headed out for dinner at the Saltgrass Steak House (inside the Golden Nugget). Great food and super service made for a nice evening. We then hit a few of the eye popping vendor booths who “hawked” their wares.